Priced a partridge in a pear tree lately? If that's what's on your true love's list this year, you'd better be prepared to shell out a little more than last year. They'll run you about $160 – a twenty percent increase over 2009. Every Christmas, Pittsburgh-based PNC Wealth Management compiles its annual Christmas Price Index, a whimsical look at the cost of living through the lens of “The Twelve Days of Christmas.” For most of its 27 years, the Index has mirrored the Consumer Price Index. This year, though, it grew 9.2 percent over last year. The Consumer Price Index only increased 1.1 percent. If you're looking to purchase the number of items specified in the song, you can expect to shell out $96,824. High gold prices have pushed five golden rings up 30 percent to $649.95. The cost of hiring entertainers has increased as well, so expect to pay more for drummers drumming ($2,552) and pipers piping ($2,356). And, surprisingly, the cost of birds could, well, “fowl” up your gift-giving budget. Seven swans a-swimming will set you back 6.7 percent more than last year, at $5,600. Two turtle doves will run you 78.6 percent more than last year at $100, and three french hens have ballooned a whopping 233 percent, to $150. Lords a-Leaping (ahem) jumped 8 percent to $4,766 – though PNC does not specify who these lords are, or how one could convince nobles to leap for so little. While I'm doubting that many of us will have the gifts from the “Twelve Days of Christmas” under our trees this year – a good thing, considering the mess six geese could make – I imagine that most of us will have some gifts under our trees. If you're like me, you'll have a pile that's almost embarrassing. And it's probably safe to say that for the last several weeks, (or months, if you're one of those “Christmas shopping in July” kinds of people) a good deal of your attention and your budget has been taken up with what to give the people on your list. Everyone wants to give the perfect gift – maybe even more than we want to receive it. You want her to break down in tears over the piece of jewelry she's unwrapped. You want him to stare open-mouthed at the car in the driveway. You want the kids to call you the coolest Dad ever. Understand, I'm all for the giving of Christmas gifts. (I can't imagine a better time of year, or a better reason, to give to others.) I just think that the way we often go about it winds up detracting from the joy of Christmas as much as it adds to it. Somehow, our nation's economic health has come to depend on whether we buy dad the 42-inch flat screen, or the 48. Somehow, we've come to believe that the degree to which we love our family and friends is denoted somewhere in the bar codes on a price tag. Somehow we've gotten the idea that being Bob Cratchett at Christmas can atone for being Scrooge the rest of the year. “Out of her poverty.” It occurs to me that most of us budget for Christmas gifts. Those come out of disposable income, or at least after the urgent bills are paid. That's as it should be, but maybe this is a good time to rethink what it means to give a gift. As we sit back and survey the mounds of stuff that we've given and received, and thank God for enough economic security to do so, let's consider some places where we're less wealthy. And let's consider what it would look like to give out of our poverty. If you're like me, you're time-poor. You always feel pressed for time, always tyrannized by the next deadline. Being time-poor makes us very good at prioritizing and multi-tasking. But it makes us terrible at knowing what's really important – particularly if it's something that doesn't come with an obvious deadline. So maybe what the people around us really need is some of our time. Our kids, our spouses, our friends, our churches – maybe what they need most from us is for us to unplug, turn off our phones, and connect with them. Our kids need us to play a game with them, go to their recitals, sit around a dinner table with them. Our spouses need us to talk to them, listen to them, laugh with them, hold them. The people in our lives need us to give them some of the resource we think we have so little of: our time. They'll recognize the value of a gift like that. Let's give from the limited supplies of energy we have. Let's give hospitality. Whatever you think you can't possibly afford, start imagining that just maybe that's what God wants you to give. Imagine the horizons of faith that will open as you trust God enough to give out of your poverty, and see him bless your gift and make it more than you could possibly have imagined. 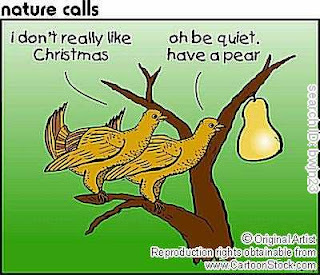 And you won't have to worry about how to ship a partridge in a pear tree.